Please refer to our stock # 8203 when inquiring. 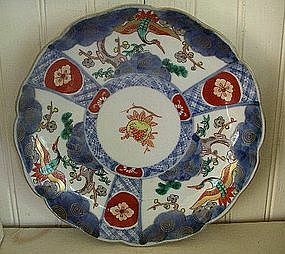 Japanese Imari Porcelain Scalloped Rim Plate, c. 1870. Beautiful blue decoration with floral, prunus and crane decoration with some brocade. Perfect condition. 8 5/8 inches.